Reproduction of the early 1900s Aladdin Kerosene Mantle Lamp Company Panel Design Lamp Shade. This classic glass lamp shade is made of hand-blown glass in a beautiful opal white glass. 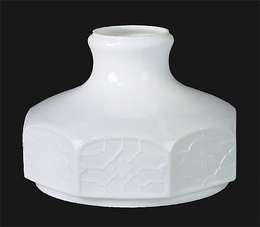 10" base diameter/fitter allows this shade to work with any 10" Aladdin Shade Ring or Shade Support, new or old. This Panel Style shade looks good on both new and antique Aladdin table lamps. Shade measures 7 1/2" high. Please note: This shade is made by BP Lamp Supply. Aladdin Lamp Company currently does not offer this style shade. This shade is at home with the Model 9, but can compliment any Aladdin table lamp.